A group of street traders at the beach front selling ther wares. Most of these traders have travelled down a large part of the continent and immigrated to South Africa in recent years looking for a better life. They are very enterprising and always have a good range of stock. Taking a different view of the Donkin Memorial one the the iconic land marks in Port Elizabeth. 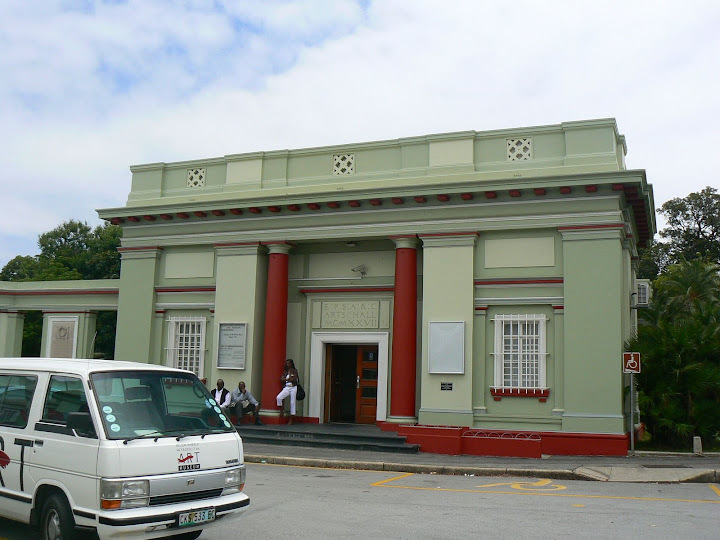 The Nelson Mandela Metropolitan Art Museum, formerly the King George VI Art Gallery, was built on Municipal land in the 19650s. It was on a lease which has since lapsed, and control of the Gallery now falls under the Municipality. It was opened on 22 June 1956 and renamed in December 2002, and over the years, has amassed an impessive collection of art, including many historic pieces. The collections are housed in two buildings framing the entrance to St George's Park and consist of South African art (particularly that of the Eastern Cape), British art, international printmaking and Oriental art (including Indian miniatures and Chinese textiles). There are plans in the pipeline to join the two buildings and create a venue where presentations and workshops can be held, without interfering with the displays in each hall. Limited exhibition space requires the constant rotation of works of art from their Permanent Collection, but researchers wishing to see specific works not currently on exhibition can do so by appointment. The Permanent Collection is supplemented by an active programme of temporary exhibitions. Currently, in the right hand hall, they have a wonderful exhibition of old paintings, some dating back to the very early 1800s, depicting the growth of Port Elizabeth from its earliest days, while the other hall has an exhibition of contemporary Eastern Cape Art. Particularly in the older part of town, one sees a lot of this kind of mixture, old buildings with new blocks nearby, old cars next to more modern ones, old lamp posts near modern street lights. it all makes for great atmosphere! 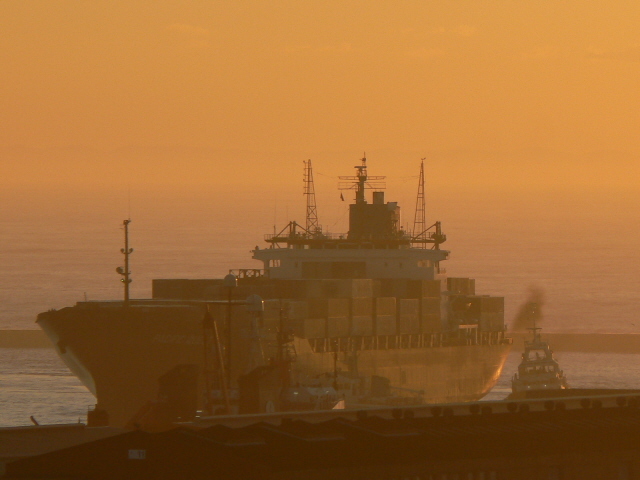 In the background, a loaded container ship comes in to Port. To the right you can see one of the tugs, guiding her in. This is the St Philips Anglican Church in Richmond Hill, with a commanding view of the sea from the brow of the hill. As you can see from the sign, it is directly opposite Richmond Park. In the early days of PE, this hill used to be a location covered with traditional M'Fengu beehive straw huts, and this church served the harbour workers and others who lived here. The park was originally their graveyard. Welcome to Ginger, at the Beach Hotel. This beautiful and trendy new spot is great place for a smart meal, but there is also a more relaxed terrace, overlooking Shark Rock Pier. I was lucky enough to have a great lunch there this week, for a friend's birthday. The sea was the most amazing clear azure blue, the white umbrellas kept us relatively cool considering what a scorcher of a day it was, and the food and service were superb. All in all a great place, we'll be back! I'm sure blogland is going to be awash with images of the latest total eclipse of the moon.... but anyway here is a sepia shot of how it looked in PE at 3.48 am on Thursday. Here is a close up look at Ken Denton's shameful legacy. Yesterday we showed you the original historic documents relating to these houses. This is how they look today. And the closer you get, the worse it is. These once proud properties are mostly rented out to illegal immigrants, and the decorative woodwork is apparently being systematically removed for firewood. The dark circle next to the door in the bottom left picture shows the place where the brass plaque declaring this a National Monument has been removed. They are being stolen from all over Central, and sold to unscrupulous scrap dealers, along with copper plumbing pipes and even church roofs! As you can see, protecting our heritage is an uphill battle, but there are many in this town who are passionate enough to continue the struggle, even if it does seem a bit Quixotic at times. Here are 3 fascinating pages found amongst the collection of historic documents at our main library. They are from the original fragile land books of the early 1800s in which all grants of land by the Colonial Government to the city were detailed. They are hand written in flowing copperplate, and accompanied by hand drawn maps by the Surveyor, to detail the exact positions of the properties. These are for the Donkin Terrace that we are currently featuring, and as you can see, they are dated 31st January 1856. The top one is the grant, next the survey drawing, and the last one details the first owners and how much they paid for the land. 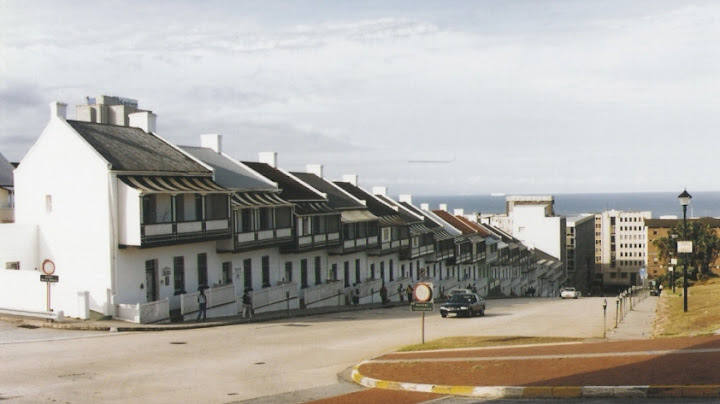 One of the iconic PE landmarks is this terrace in Donkin Hill, built in the early 1800's. This photo was taken recently. Below is one taken several years ago, so that you can compare, and see what has become of these stunning old houses. Sadly, they have become dilapidated and are deteriorating daily. This terrace is one of the earliest in Port Elizabeth, and when people think of this town, is one of the defining images that comes to mind. It is a National Monument, and in the 80s, was lovingly restored. We visited one that belonged to an aquaintance at the time, and were captivated by the wide hand hewn yellowwood floorboards and beams. Sadly these magic little cottages have gone the way of many of our heritage buildings, and fallen into the hands of an owner who has not maintained them. Although laws are in place to protect heritage sites such as this from uncaring property developers, they have so far not been enforced, and the level of decay may, in some cases, already be beyond the point of no return. It is a disgrace that the municipality is allowing this situation to persist! There are moves to give sharper teeth to the by-laws, and we can only hope that there is the will and capacity within our Municipality to bite back in these situations. Until then.... the cloud hovers. This is a different view of the Donkin reserve looking towards the Hill Presbetarian Church and the historical homes on the Donkin Terrace. We plan to do a series on what is happening to this historical area that is such an integral part of the Port Elizabeth heritage. Sometimes when we go for early morning walks to catch the sunrise over Algoa Bay, we see more than we bargained for. Here is a shot of the historical suburb of Richmond Hill relected in the windows of the Eric Tindale building. On top of the hill we have a lovely quiet suburb, but a short walk below us is the city centre. Not too busy at 7:00 in the morning. Here's a view of the Pier you won't see every day.... taken from a yacht when we were lucky enough to go sailing a couple of weeks ago. If you live in the area, and think this looks cool, do yourself a favour and check this out... on 23rd and 24th of February, the Algoa Bay Yacht Club is having an open weekend to introduce the public to the joys of sailing. And here's a bonus shot, with another of the yachts passing the end of the pier. An incredible moon rises over the pier. 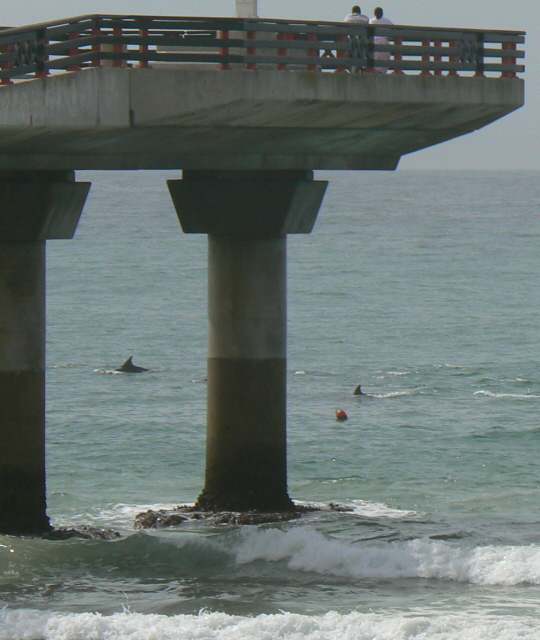 Shark Rock Pier is a relatively new feature of the PE coastline. Construction of the 137m long reinforced concrete pier was started in 1988, to save on of our main beaches from erosion. In common with many coastal spots (the same is happening in St Francis Bay to an alarming extent) a combination of the stabilisation of mobile dune fields in the city by alien Port Jackson Willows, together with the construction of buildings and roads, cuts the feed of sand to the beaches. Wave action then scours the existing sand away, and as it is no longer replaced, the beach eventually erodes away. When we got here in 1978, Hobie Beach was a wide expanse of sand with rocks behind it along the pathway. In fact it was the first beach we went to when we got here, and here are pictures taken in March 1978, of Max and our first dog Cindy having a swim there, as well as a view towards the harbour, of the spot where the Pier now stands. By the mid 80s it had been eroded to a narrow rocky strip with barely any beach. The Pier has changed all that, and not even a decade later, Hobie Beach is a magnificent sweep of sand. As you see in the main picture, just a suggestion of the underlying rocks now remains. It is hard to take a picture of our main beachfront these days without somehow including the Shark Rock Pier, so we thought we might as well feature it in a variety of moods. First up, one day as I was driving past, I spotted a school of dolphins cruising past, and swung into the carpark to photograph them. By the time I got there, the last few were just passing the end of the pier. Can you imagine what a cool view those people on top must have had?! By the way, we are getting quite a few visits from people who are ex-PE people, living overseas, or people like Kate who have visited here and grown to love it. If there are things you want us to feature to help with the homesickness, let us know and we'll do our best! Since we are on the subject of our interesting 1st world/3rd world blend, here's another sight we commonly see around here. There are all sorts of controversies surrounding the care of the donkies and the threat to motorists on busy roads, but they do provide a living to enterprising people who would have no other way to survive, and they are certainly are picturesque! Here they are in the upmarket suburb of Walmer. This lady, walking down the main street in the new pedestrian mall section, is wearing modified traditional clothing. (The modern scarf covering the head and apron replace the wonderful traditional clothing of the rural Xhosa.) These women are incredible, they have the ability and strength to carry huge weights and difficult shapes on their heads while walking along. Potential models should come to them for lessons, I don't know if you have ever tried this, but it is NOT EASY! This 3rd world meets 1st world aspect of Port Elizabeth is one of the things we love about it, and that gives it a unique character. This is the Mount Road Police Station. It is hideous on many levels, the most apparent being the austere looking architecture which is typical of many apartheid era government buildings. There is a sort of repressive nazi look about them before you even know what went on inside. This building has a nasty history. It was previously called Louis Le Grange Square, named after the then Minister of Law and Order, who was responsible for some of the worst human rights abuses that went on at the time. The notorious Security Branch had their offices on the fifth floor, and there were many deaths in detention which were put down as "the detainee committed suicide by jumping from the unbarred window to escape detention".... If you want to know more and are in the mood for some depressing reading, the TRC commission findings shed light on how the Security Police operated, and saw themselves as completely above the law. A dark period in South African History. On a more positive note, you can see workers in the foreground, digging up the pavements. This is actually good news! Our previously state run Telecomunications supplier was "privatized" many years go, but has enjoyed a monopoly all this time, thus giving it freedom to overcharge and provide really shabby service. (Telkom also owns major shares in Vodacom, and regulate cell phone rates, so ours are very expensive.) Finally, a competitor has been licenced, and Neotel is busy digging up our streets at the moment to lay fibre-optic cable. Most of us are delighted to endure a bit of inconvenience if it means we might soon be getting a decent telephone service at competitive prices. This bright and cheerful looking building is part of the new section of the Law Courts in North End. It is a bit misleading, because most people who are going inside are far from cheerful. Whether you are a defendant, or a witness, usually the process of the trial is taxing for all. Max and I found ourselves there this week to give evidence against an intruder we caught in October 2006. (18 months ago!!!!!) If you want to know more, you can read about the incident and the court here. I had to put my camera in a locker, but our cellphones with cameras were allowed....?! Beware, this road is not for sissies! You can see lots more pictures of this trip on Sue and Max's personal blogs. Yesterday we started on a journey to the nearby farming village of Patensie, via the Winterhoek mountains. Along the way (at S33 43 36, E 25 05 59, if you want to look it up on GoogleEarth) we came across one of the dams that supply PE with water. The Bridge we stood on to take this photo is called the William Snyman Bridge, Sand River. I have done a more detailed post about the first part of the journey here, with a map showing the route we took, and also showing Port Elizabeth in relation to St Francis, so you can get a better idea of how it all fits together. The flowers in the foreground are typical Eastern Cape Fynbos, part of the Cape Floral Kingdom, the smallest but richest of the world's six floral kingdoms. We went for a wonderful drive yesterday, along the Eland's River Valley, round to the little farming village of Patensie. It is one of those "where do I start situations because we went BALLISTIC taking pictures, the scenery changed around every bend, and each view was worth several shots... ho hum. Anyway, in coming days we will post a few here, but if you like what you see and are interested in seeing more, we will have lots on our personal blogs in the near future. Thanks to Max's new toy, a GPS (courtesy of one of the companies he consults for, a gift while he was sick) we will even be able to give co-ordinates, so you can see where all the views are on Google earth. But for today, let's whet your appetite with a view of the Cockcomb mountains, with the typical fynbos vegetation that covers that area. Another in our new series on Graveyards. This head stone, at St Mary's Cemetary, South End, bears mute testimony to George Urquhart, master of the barque Shepherdess who drowned off Cape Recife in 1859. This was before the Cape Recife lighthouse was built. Cape Recife has some treacherous currents and reefs and has claimed many a ship that has ventured in too close to shore. These days with instant worldwide communications, it is hard to imagine what it must have been like for the families of these sailors, waiting sometimes years to know if their loved ones are alive or not. In trying to decide which photo would depict our city for yesterday's theme, we considered many options. In the end the beach won. But this photo was one we also wanted to use, because the Donkin Reserve is the sort of PE icon image, and can be seen on the hill in the background here (the lighthouse and pyramid). Also because we are a Port, and this shows part of the harbour, and renowned for watersports, thus the yacht. Beachfront holidays, wonderful weather offering fun in the sun on sweeping expanses of white sand, safe swimming, the Pier, and the entertainment complexes around it. Many other City Daily Photo Blogs around the world are also participating in this theme, pop in and pay them a visit.